My family is a little different; we march to our own beat. So while all the Cuban-American families through out South Florida cook lechon for Noche Buena, my family makes a traditional Bandeja Paisa. On Thanksgiving, we pass on the dry turkey and have a Cuban feast instead. My mom is Colombian and my dad was Cuban, so it's how we have always celebrated in my house. So all the dishes most Cuban families enjoy on December 24th, my family had it on Thanksgiving. That includes the roasted pork shoulder that has been marinating in Cuban mojo for at least 24 hours. I'm sharing with you guys my dad's recipe; I had to convince my mom to let me share this recipe on my blog. 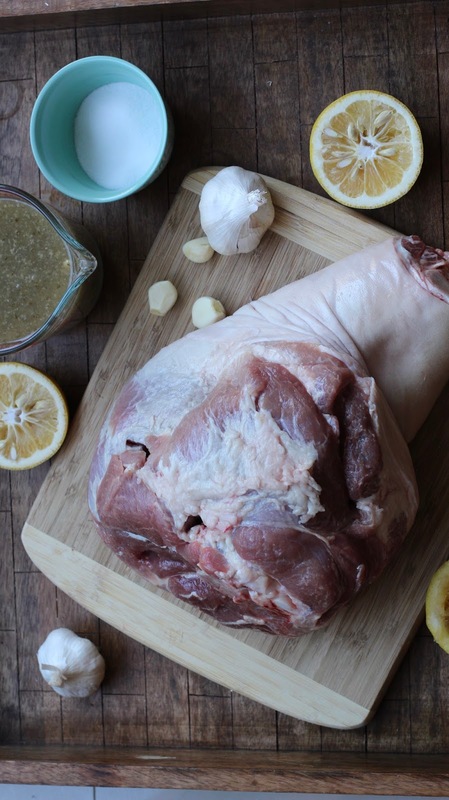 You can never go wrong with pork, it's such a versatile meat that it can be used in just about any recipe. 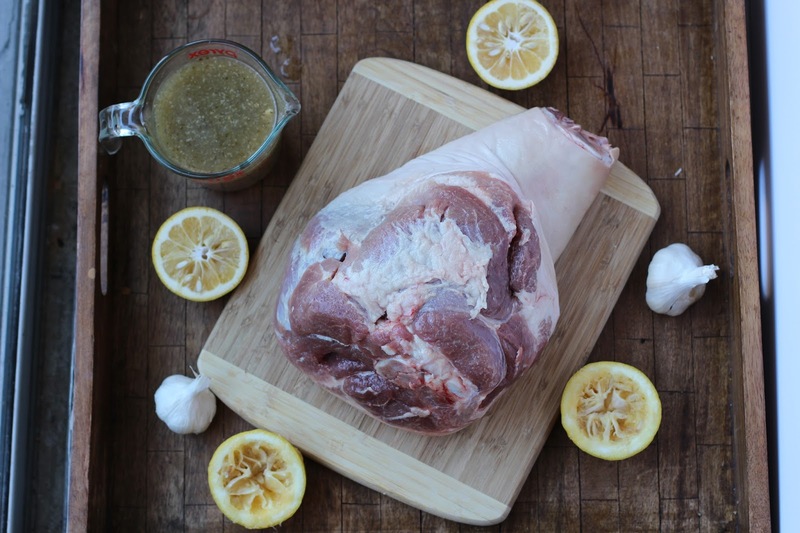 During the holidays, pork is a central dish to every family gathering and celebration. 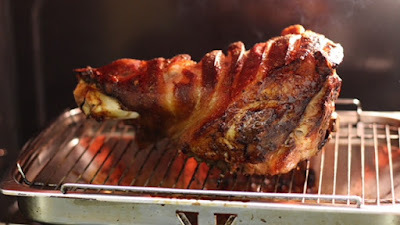 You can always head to PorkBeInspired.com for great pork recipes from great chefs from around the country. So lets get right into the recipe, shall we? One to two days before you cook your lechon, begin the marinating process. I typically let the pork shoulder marinade between 24-48 hours. 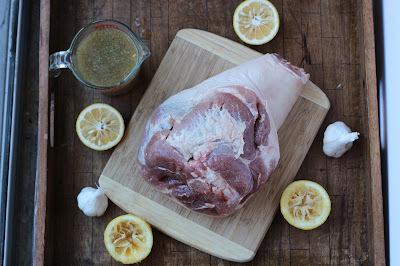 Using a medium size knife, make slits into the meat (not the skin side) and insert the garlic cloves deep into the meat. Then rub the sea salt all over the meat and skin of the pork shoulder. In a large oven-safe marinating bag, place the pork shoulder and the Cuban mojo. Place the bag in a 9x13 baking pan and place it in the refrigerator for at least 24 hours. Once you're ready to roast, preheat your oven to 250 degrees. 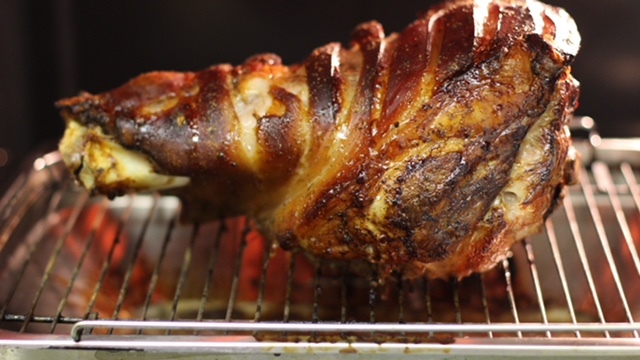 Remove the pork shoulder from the marinading bag and place it skin side up on a rack in a roasting pan;. Pour the marinade in the bag into the bottom of the roasting pan plus one cup of water. Using a knife, score pork skin to make strips across the skin. If you're feeling fancy, make a diamond pattern on the skin. Loosely cover the pork shoulder with aluminum foil and place in the oven. Bake at 250 degrees for the first 2 hours then increase the heat to 350 degrees and bake until a meat thermometer reads 180°, 4–5 hours. 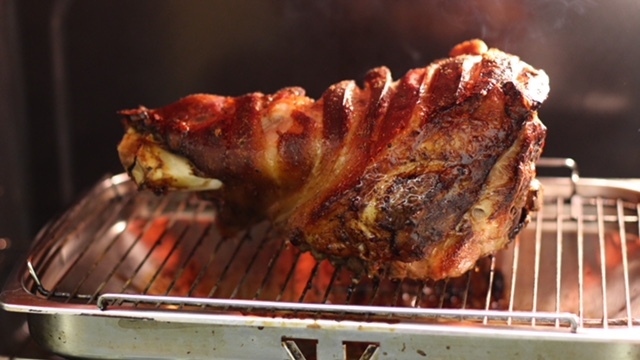 Remove foil; broil until the skin is crispy, 5–10 minutes.